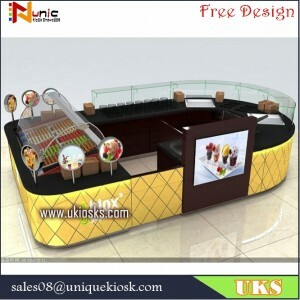 Details of this ice cream kiosk. 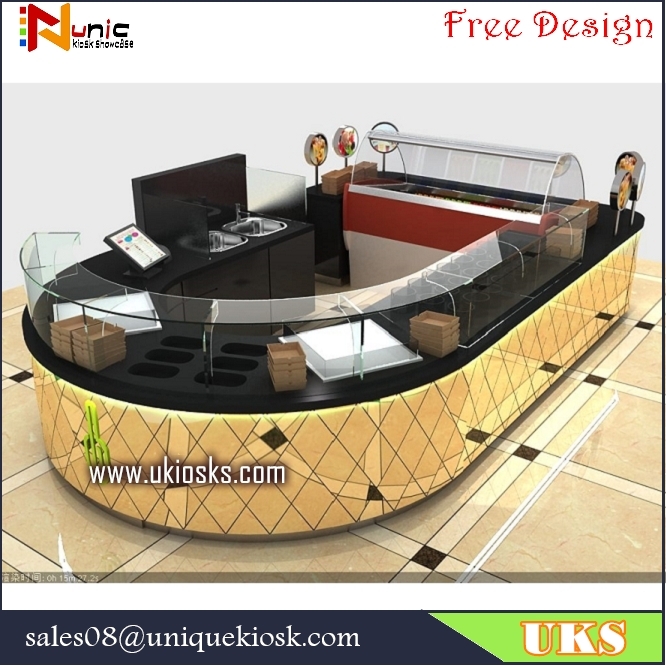 this is a ice cream kiosk, can used in mall or outdoor, mainly material is MDF, surface finished is painting, artifical stone, stainless steel skirting, the size of this kiosk usually is 4000*3000 * 900mm, can customized it to you, all of anything about this kiosk can customized it to you. This kiosk not only can selling ice cream , but also can selling juice, coffee, yogurt, and so on. 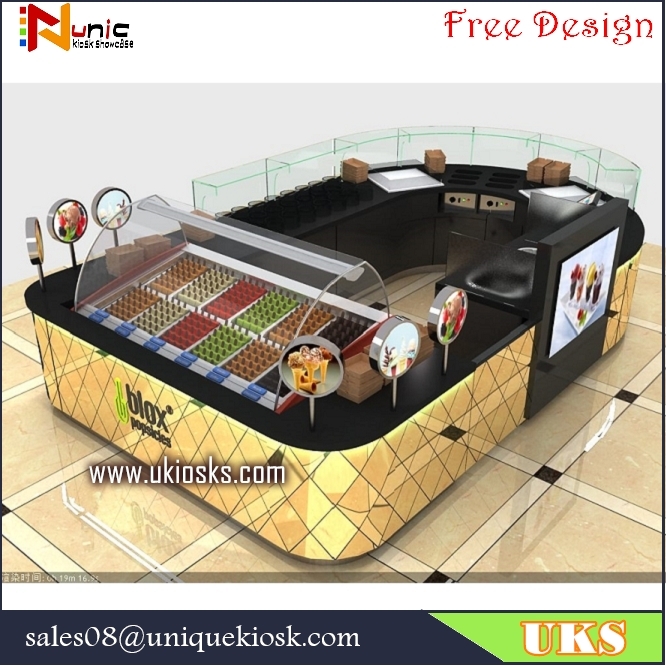 send the 3 D design for your check, when the design is confirm, we will start drawing the construction plan. packing this kiosk ( this kiosk + foam inside + wooden box outside ) , shipping this kiosk to your port. 1. 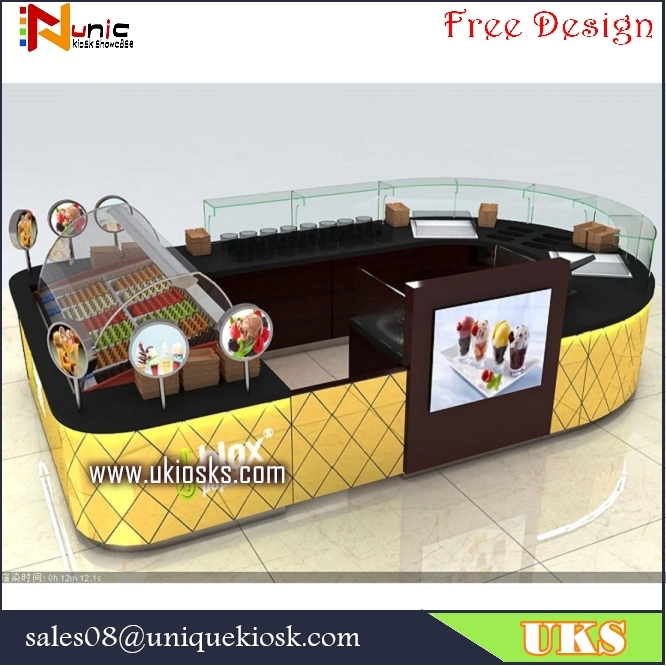 3D MAX design for you to get what you want. 2. customize for you with your special requirements. 3. factory wholesale low competitive price. 4. security safe package makes no damages. 6. timely delivery without delay. Shenzhen Unique furniture limited company, honored as China’s leading shopping malls and stores furniture suppliers,has more than ten year experience in creating professional showcase, cabinet, kiosks.We design different kinds of shopping malls kiosk, counters, cabinet ,carts, food kiosk ,coffee kiosk , tea kiosk ,hair dressing kiosk and showcase ,some as cashier, jewelry , jewelry store design decoration, cosmetics showcase, showcase mobile phone, clothing shoes showcase, crafts gift showcase, supermarket stores overall matching furniture various specialshaped showcase. Our work Process covers the carpentry, paint, hardware, stainless steel, iron, acrylic, we can make it in fashion and unique style, we have personalized management, standardized production process, advanced process equipment, We can design large shopping center and complete the construction of large area, restaurants, coffee shops, clothing stores decoration design quantity format. Make your brand in the market to win more economic benefits.